Here’s a light, simple, dish that is at once a Spring/Summer side dish salad, as well as a good foundation for a main dish. 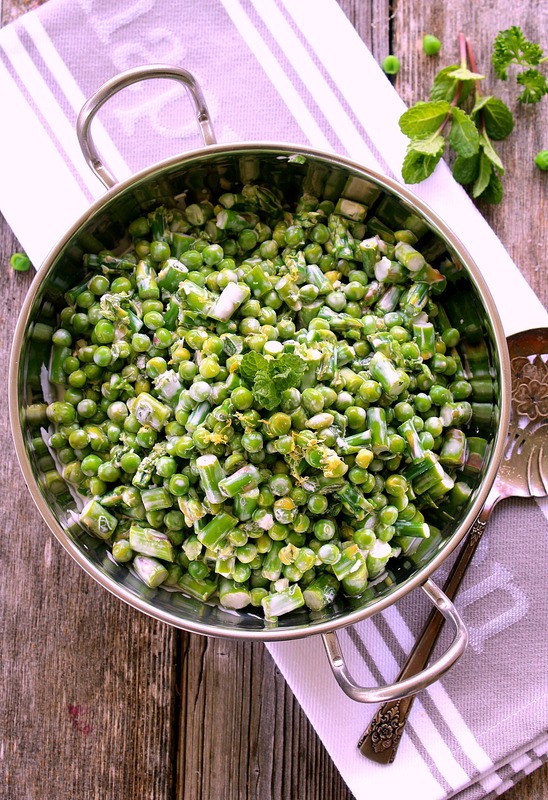 Spring Salad with Asparagus and Peas is vibrant with color and loaded with flavor and texture. And it doesn’t get easier than this. 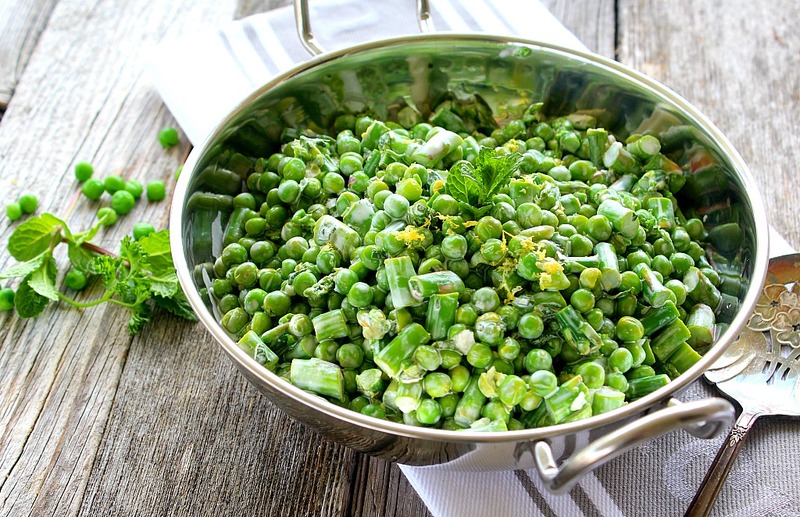 Use frozen peas, no need to wait for the super short fresh-pea-season, not to mention having to take the time to pop all those peas out of the pods. But fresh asparagus is a must, briefly steamed to bring out the color and enhance its flavor. Such a simple and pure combination, we couldn’t get enough and I know you’re going to love it! The dressing for this salad is also simple, but loaded with perfect complexity; fresh mint, lemon juice and zest, garlic and parsley-mixed with a small amount of mayonnaise (vegannaise is equally good). 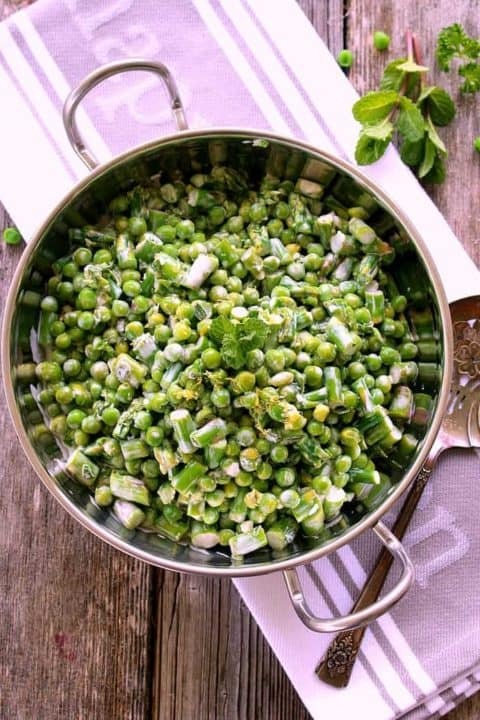 As I already mentioned, this salad with peas and asparagus is excellent just like it is for a side dinner salad; or pair it with bread or toast for a light lunch. 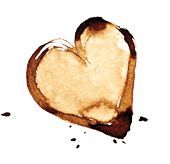 But take this easy beauty one step further for a fancy-looking meal with a chicken paillard sliced on top. 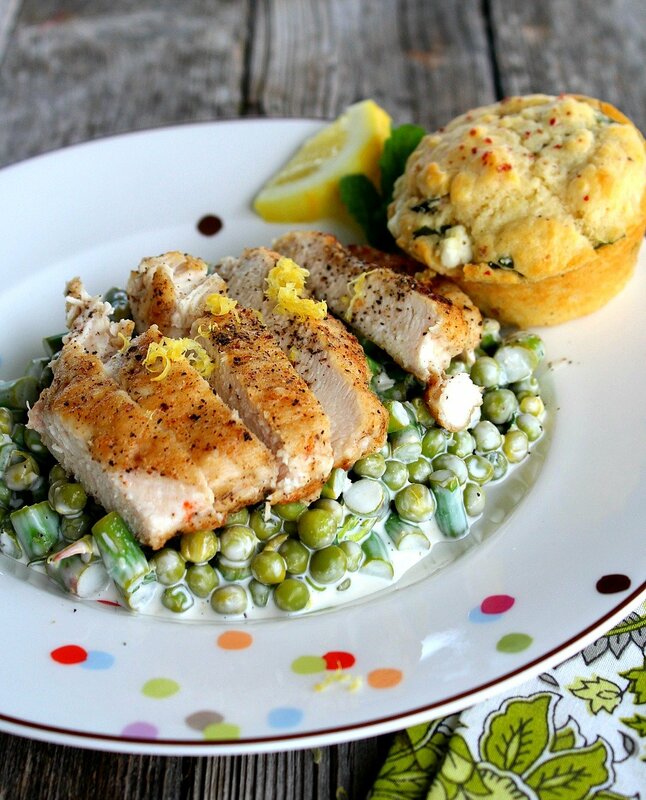 Chicken paillard is simply chicken that is pounded out and then grilled or sauteed. All I did for this juicy, flavorful chicken is to pound out chicken breasts to uniform thickness; then lightly dredge in a tiny bit of flour seasoned with salt, pepper, garlic powder, any seasonings really. Shake off excess flour mixture and sautee’ in a skillet heated with olive oil over medium-high heat. Cook about 4 minutes per side, or until internal temperature reaches 165F degrees. The chicken is crispy on the outside, but perfectly juicy and tender inside, and in no time at all. There you go, complete dinner just like that. It looks fancy, tastes fresh, but no matter your culinary expertise, you can have success with this one. This is a must try recipe for your next dinner with company. Individual servings with the chicken paillard I feature in this post, or with diced chicken mixed throughout. This is a great pairing for your Easter ham, and the color is glorious. Easily doubles or triples. This salad can be made a day ahead of time and is excellent for a vegetarian dish or served with chicken over top or mixed in. Barely blanch the asparagus but don't cook to much. Place a steamer insert into a medium sauce pan and add enough water to almost reach steamer. Heat to low boil. Add asparagus spears and cover. Steam for about 1-2 minutes only, just until asparagus turns bright. Drain off boiling water and immediately pour cold water on asparagus to stop cooking. Cut into 1-inch bites. Set aside. Combine the mayo, lemon zest, lemon juice, parsley, mint, and cloves in a large bowl. Stir until mixed well. 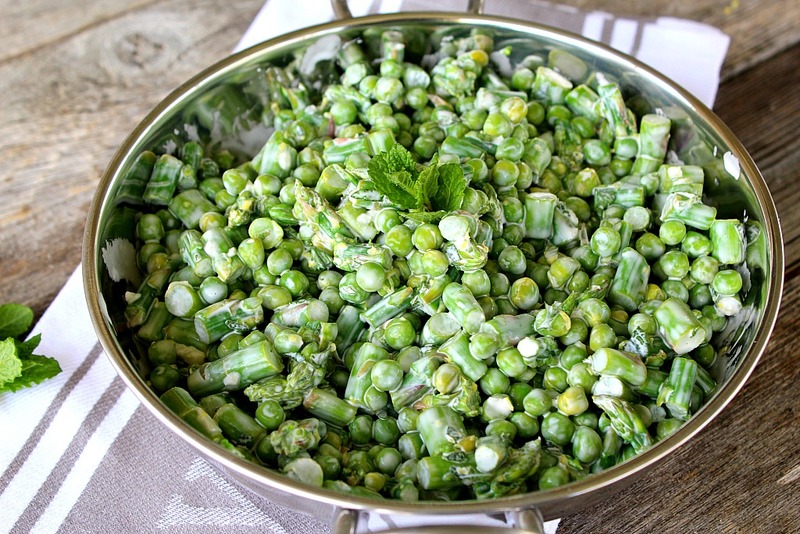 Add asparagus and peas and toss to coat. Refrigerate until serving, at least one hour, up to one day. Give one more toss before serving. This salad is excellent on its own and is also delicious with cooked chicken tossed in or served on top. YUM! And to pair it with chicken, totally!